On December 17 the mascot for Sanya, one of the stopovers for the Volvo Ocean Race 2011-12, was officially unveiled, according to the Sanya organizing committee. 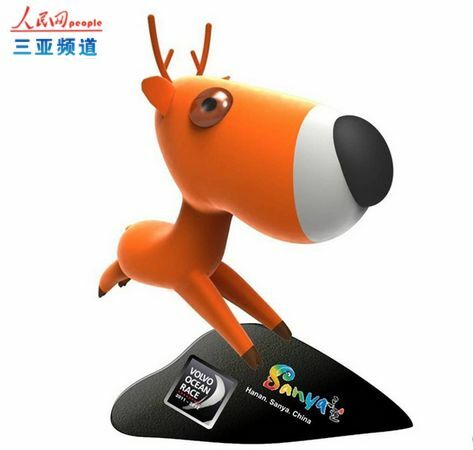 The mascot, which is named Lulu, is a cartoon deer, and was designed by Liu Yong, an American Chinese after being inspired by the history of Sanya as a Deer City. Deer in Chinese is called Lu, symbolizing peace and fortune. The running mascot conveys the concept of sailors’ forwardness during the race. The organizing committee said it began to select mascot designs in October and had received 80 designs. After the final selection, 10 mascot candidates were announced and the winning candidate was chosen by a panel of judges, combining the results of the public voting. Sanya has won the bid to host the Volvo Ocean Race as one of the 10 stopovers and the sailing teams are set to arrive at Sanya on February 4, 2012 and stay till January 19.